Bring the kids to Yellowstone National Park to see unique natural attractions, partake in ranger programs, and perhaps to enjoy their first camping trip. 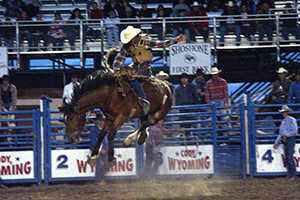 Cody Nite Rodeo - Fun for the whole family! 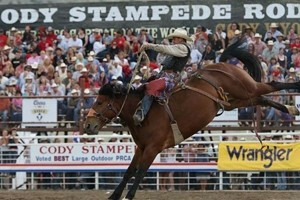 Travel to Cody for a fun-filled night at the world famous Cody Nite Rodeo! Running every night through the summer, it's a MUST DO during your Yellowstone vacation! 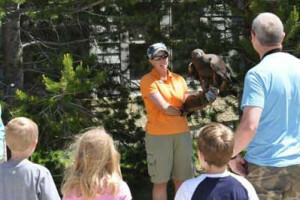 Kids love seeing our large wildlife animals (bears, wolves, raptors) in a safe and enclosed setting, and learning their importance around Yellowstone. Open Year Round. One of nine stops on the Million Dollar Gold Tour Series insuring the top cowboys from across the continent will be competing. Experience one of the best rodeos in the world! Kids love watching, and participating, in local rodeo. Our 2019 season runs June 12 - August 31. Kids = $8, adults only $15. Come take the family for some real fun. Ask a kid what they want to do when they visit Yellowstone, they say 'Ride a Horse'. We can help, with 1/2-day or 2-hour options, all priced for maximum family fun. 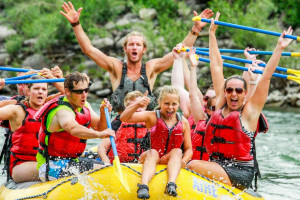 Two-hour scenic or whitewater float trips on the Yellowstone River leaving 5 times daily from Gardiner MT. Also offering cookouts, trail rides in a corral, biking and more. 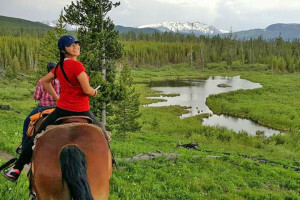 Enjoyable horseback trail rides for all ages, just 7 minutes west of West Yellowstone. Rides are on gentle horses through meadows and along creeks - see wildlife. With 56 years experience, our safety record is second to none. 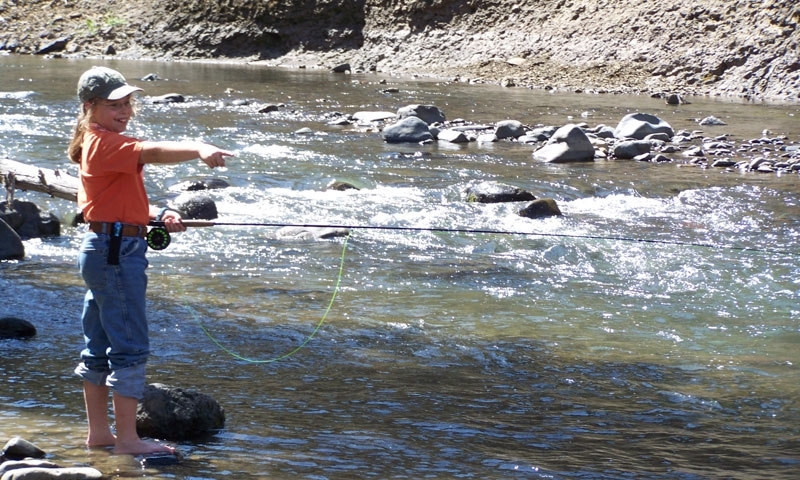 Seniors, kids and adults all love our trip options for scenic, whitewater, and combo trips with meals on river. 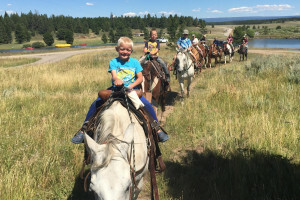 Kids can enjoy a wagon ride and horseback rides as part of our 4-day, 3-night backcountry adventure between Teton & Yellowstone Parks. All meals included. Keeping kids engaged is one of our best attributes. We'll show them creeks, geysers, mudpots, wild animal tracks, poo and much more. They'll want to come back. 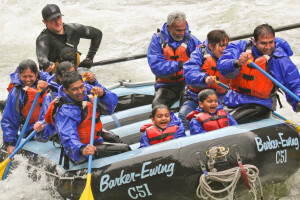 Safe and exhilarating adventure for all ages. Select from a couple hours to all-day fun. 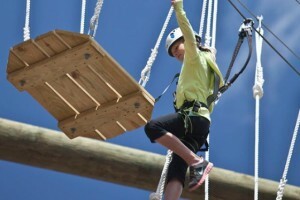 Ropes & Zipline, plus rafting and more. Book online! 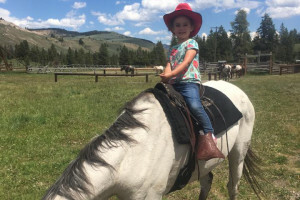 Kids and families love camping in comfort, like our luxury glamp tents, plus included dinner (cowboy cookout), breakfast and morning horseback ride. Affordable and easy. 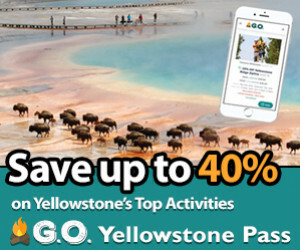 Experience the magic of Yellowstone with a unique family adventure. Explore canyons, waterfalls, and geyser basins with an expert in-park guide. Ski & Snowcoaches too. Year-Round tours in Yellowstone (summer van tours or snowcoach tours in winter) are fun for everyone, especially the kids. Experience our historic Bombardier coaches. The Best Opportunity to Watch & Photograph Wolves & Winter Wildlife in Their Natural Habitat! Great for the whole family, the Yellowstone IMAX Theatre features the latest IMAX films as well as a few classics. Located in West Yellowstone. 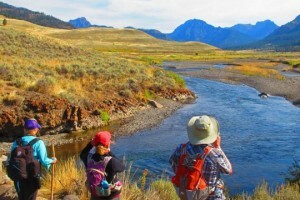 What can I do in Yellowstone National Park with my kids? Stop by any ranger station or visitor center and pick up a Junior Ranger Program booklet. 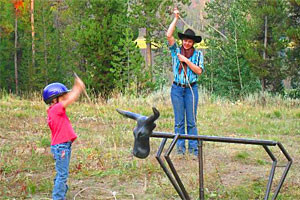 Kids can complete the activities as you tour the park. When they finish it up, they will earn their own Junior Ranger Badge. On a hot summer day, drive the Firehole Canyon Drive and park by the popular swimming hole. Steps lead down to the swimming are and families can literally spend an entire afternoon here. 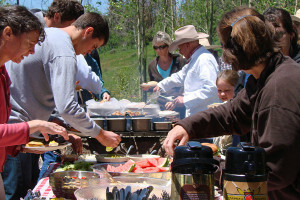 Whether it's the family's first or 50th camping trip, Yellowstone is ideal for family camping. A number of large campgrounds offer fantastic sites close to park attractions. Most campgrounds feature nightly evening Ranger Programs as well. Yellowstone is almost like an amusement park, offering easy to access natural attractions. You can easily drive through the park and go from stop to stop, following an easy boardwalk trail from your car. The short hikes are great for younger kids. For older kids and teenagers, there are a number of opportunities for half day hikes. Kids will love horseback riding or an overnight llama trek. It's a great way to explore Yellowstone's vast backcountry without the hassle of having to carry a huge backpack.